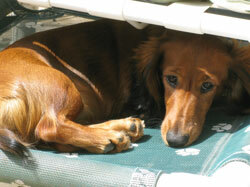 Bossa is a standard red longhaired dachshund who joined our household in June 2012. 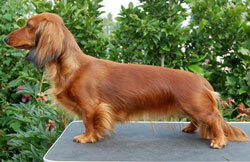 She was born on the island of Gotland, Sweden and bred by May-Gun Badinge. 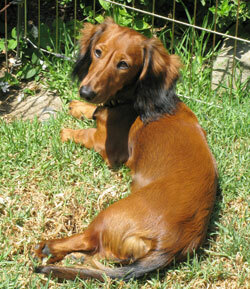 Bossa is descended from Hound's (Marie Gadolin) and Dorndorf (Patt Nance) dogs. Bossa had a litter of five puppies sired by Basotto's Teo in August 2018. 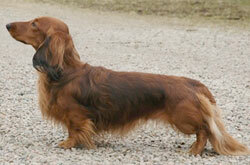 Bossa's Sire: Swedish Champion Hound's Uncle Sam, son of Nick v Dorndorf. Photo by Marie Gadolin. 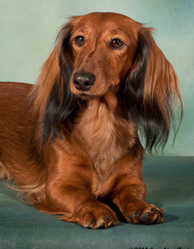 Bossa's Mother: Swedish Champion Hound's Mercedes. Photo by Rebecca Martis. 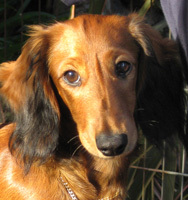 Bossa's first AKC title was her Junior Earthdog (JE) title which she earned in June 2013. 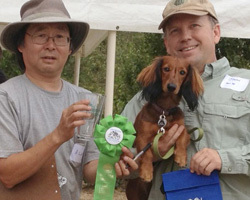 Bossa earns her first Junior Earthdog leg on March 30, 2013 at the Sierra earthdog test in Anaheim CA. 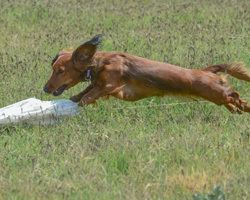 Bossa earns her Junior Earthdog title on June 24, 2013 at the GWTA earthdog test in Anaheim CA. In September 2013 she earned her second title, the Coursing Ability (CA) title, at the Evergreen Basenji Club's test in Auburn Washington. 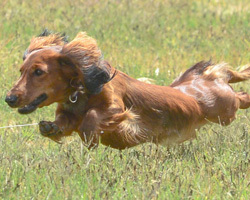 Bossa earns her first and second coursing legs on 1 June 2013 in Chino, CA. 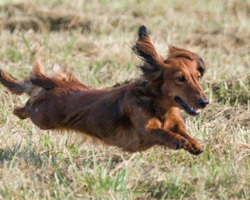 Bossa earns her third and fourth coursing legs on 1 September 2013 in Auburn, WA. Having earned Bossa's CAT, Diane and Bossa watch as John releases Asti for her run. 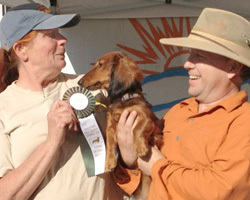 Bossa earned her Field Championship with a first place at the 2014 DCA National Field Trial in Vacaville, CA. She then went on to win Best Open, beating the winner from the dog stake. Bossa was runner-up in the 2014 DCA Triathlon, with qualifying scores in Field, Junior Earthdog, and Open Jumpers with Weaves agility. Her pack mate Olive won the Triathlon. Bossa's Agility Career is off to a good start! In 2016 and 2017 she qualified for the AKC National Championships, and in January 2017 she earned her MACH title. 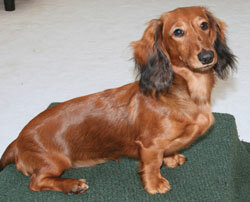 Click here to follow Bossa's agility career and see some videos. In January 2019 she earned MACH2. 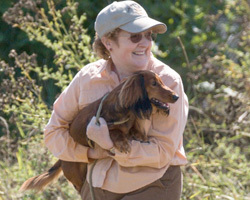 Bossa qualified for and competed at the AKC 2017 Agility Invitational in Orlando FL in December 2017 and earned the High Scoring Dachshund medallion. She qualified again for the 2018 Invitational, but did not compete due to whelping a litter in August. 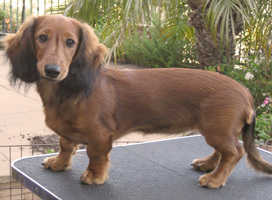 Bossa was the #1 ranked dachshund in the Breed Power 10 rankings for 2016 and 2017 -- these recognizes the fastest dogs in agility by using average yards per second. Bossa earned her Rally Novice title on 1 May 2016 with a fourth place finish in a challenging park environment. Bossa earned her Beginner Novice obedience title on 10 March 2018 at the Seattle Kennel Club all breed show, with a 189.5 that placed fourth. This was a nice performance in a loud, busy environment. We met Bossa and her littermates on 9 June 2012 at their home on Gotland. 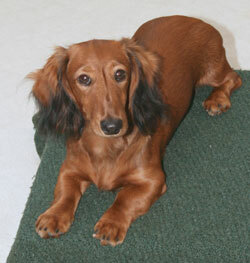 After observing the puppies and giving them the Volhard test, we decided that Bossa was our choice. The next day Bossa started her voyage home with us. Bossa's Journey to California (June 10-14, 2012) including her first puppy kindergarten class. 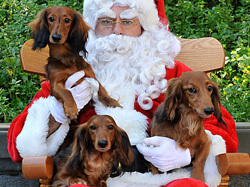 Bossa, Olive and Asti (left to right) get a photo with Santa in December 2012. 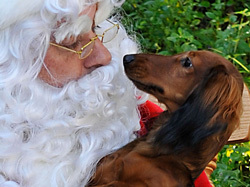 Bossa meets Santa for the first time. 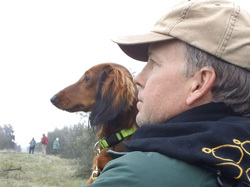 Bossa and John at Bossa's first field trial in December 2012. She was called back high and finished 2nd for 6 points. 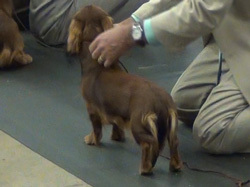 Bossa at her first dog show in January 2013. She finished 2nd in the 9-12 Puppy class. Bossa at 5 months old. Bossa was the smallest puppy in a litter of 4 girls and 3 boys. 14 weeks 8.5 7 3/4"
4 months 10.5 8 1/2"
5 months 12 8 3/4"
6 months 13.25 9 1/8"
7 months 14.25 9 1/8"
8 months 14.5 9 1/2"
9 months 14.5 9 1/2"
1 year 15.25 9 1/2"